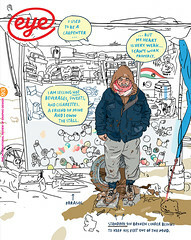 Christoph Niemann’s Sunday Sketching (Abrams, $40, £25) includes a few ‘greatest hits’ from his time in New York (see ‘Storytelling giant’ in Eye 72), but most of the book covers his life since he moved to Berlin with his growing family, exploring the limits of illustration through technology that has rapidly changed the way we make, disseminate and consume imagery. The text, often handwritten, has lashings of self-doubt, revealing that the ‘question people ask me more than any other is: “Why the hell did you leave?”’ Moving to Berlin, he explains, felt like going back to art school, with room to think, work and make mistakes. Niemann breaks down his cloud of generic fears into three parts: being not good enough; irrelevant; and out of ideas. How he deals with these anxieties forms the bulk of the book, with mind-blowing challenges that include reporting the 2011 Venice Biennale without technology or change of clothes (‘In the history of arts journalism, I may be the first person to pick pieces for review based on how easy they are to draw’) and the New York Marathon. The latter involved drawing and tweeting on the run for his ‘Abstract Sunday’ slot in the New York Times, ‘the most insane amount of practising I’ve ever done for a column’, he says. Discussing his fear of running out of ideas, Niemann makes a strong case for just ‘doing’, so that ideas and craft can speak to each other. ‘In my experience, the really valuable new ideas come from the process … you take what you know and expose it to something you don’t know and observe what happens.’ He notes that the present ‘pillars of his practice started as a silly experiment’ on a weekend five years ago. The book closes with a new Instagram project. Niemann snaps a simple object – a spanner, headphones, an in-flight coffee cup – and adds a drawing to create a new meaning and a joke. 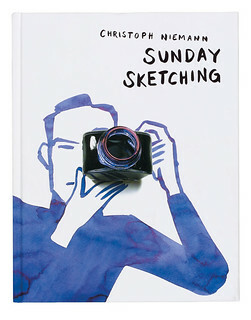 Cover of Christoph Niemann’s Sunday Sketching. 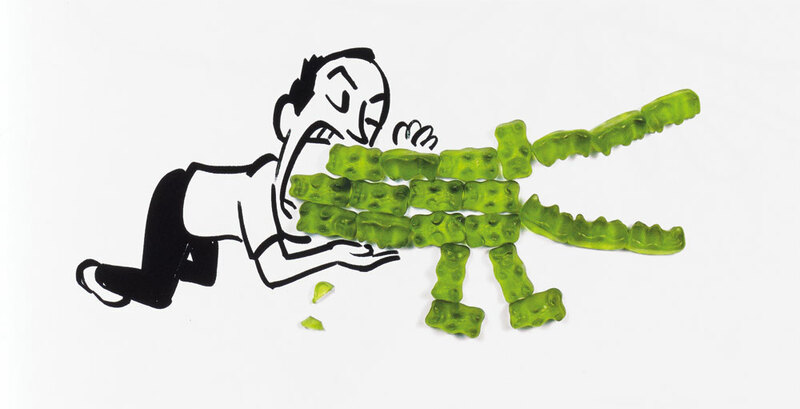 Top: Art from Christoph Niemann’s ‘The Gummi Bear Chronicles’ written for the New York Times.